When I started planning HL for iOS, I figured that I'd charge $5. It wasn't a casual-tiny price, it wasn't full-on-desktop-game. (2010 was early in iOS history but we could already see what "race to the bottom" meant.) I wrote up the Kickstarter page and offered $3 as the basic backer pre-order level -- "a $5 value!" So that was pretty well locked in. During development I decided to release the game for Mac and Windows as well, but I kept the $5 price point. I'm not sure I had any hard logic for this beyond "I don't want to think about it." With a dash of "nobody will complain if it's the same price everywhere." I've had a couple of limited-term sales, but HL has basically been $5 since it launched. Now I'm (slowly) approaching a Steam release. Scary! And worth revisiting my old assumptions. Should I raise the price? The good example on everyone's mind this week is Stephen's Sausage Roll, which launched with a $30 price-tag and an equally brazen attitude of "I'm worth it". Or, more, precisely: "Do you want this particular kind of puzzle? Are you going to jump up and down on it until your knees catch fire? If so, I'm worth $30 to you. Everybody else, just walk on by." Also, as my friend Chris noted: "if this was a $5 game i'd just put it down and say 'whatever, too hard' [...] but being invested means i have to play it." Buying a game is buying into the game. We all know this, but the difference between $5 and $30 really throws it into the spotlight. So maybe this all describes Hadean Lands too? Parser IF is niche appeal in a nutshell. Maybe I should kick it up to $7 or $10 on Steam. Or more? I asked around my IF friends, and several of them said sure, they'd pay $10. Of course, they all own the game already, so it's not exactly a useful sample! What price? Dare I go beyond $10? Do I also raise the iOS price? I'm adding the journal and map features (which exist on iOS but have never been seen on Mac/Win). I could say it's an "enhanced version" because of that. I'm also fixing some minor but long-standing bugs. It's probably asinine to call it "enhanced" on that account, though. I really don't have time in my schedule to extend the game in any way (beyond the journal and map UI). When it comes down to it, will Steam users come after me in a torch-bearing mob for raising the price of an already-released game? Or is "new to Steam" good enough? 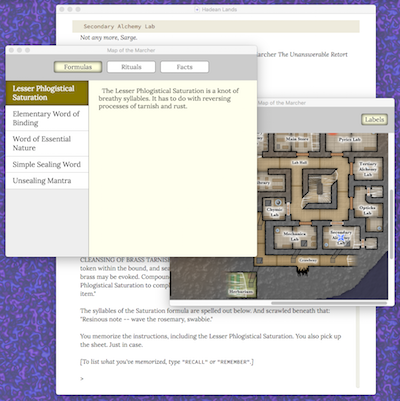 Tags: hadean lands, humble, if, interactive fiction, ios, itch, pricing, steam. I want to respond to Ted Casaubon's article, "Safeguarding Your IF Voting From Animal Attack". The author looks at our IF voting traditions (IFComp and the XYZZY Awards) and puts them in context with last year's furor around the Hugos, the (much more famous) annual awards of the science fiction and fantasy community. This is an excellent article overall. Ted's comparison is absolutely one that weighed on my mind last year, and still does today. The 2016 Hugo nominations were last month, and XYZZY nominations just started. Does the videogame world have a radical-angry faction analogous to the Sad/Rabid Puppies? Why yes. So it could happen here and we should worry about that. The article talks about that possibility and it does a good job. Continue reading IF awards and how we think about them. Tags: awards, hugos, if, ifcomp, interactive fiction, spag, xyzzy. Yes, two different windows are titled "Map of the Marcher". I'll fix that. Once this is ready, I'll soft-launch it as an update for existing HL users (people who bought the desktop version through Itch or Humble, plus Kickstarter backers). I'll also post the process of turning your Glulx game into a Lectrote app like this. In other news, I was interviewed on another podcast! Guy Hasson of Blind Panels talks to me about pretty much the entire history of IF. Plus other stuff I've done. Tags: glulx, hadean lands, if, interactive fiction, interpreters, lectrote, software, steam.